Two pack Custom made wood 12 soda pop bottle crates!! These very strong crates will easily hold any of our glass soda bottles. The crates can also be used for other purposes and the dividers can be easily removed. 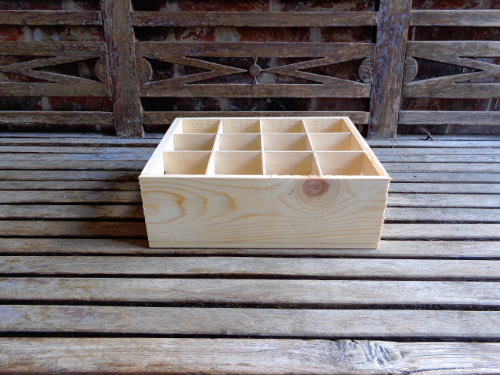 The crate measures 13 inches long, 9 1/2 inches wide, 4 inches tall and have handles cut into left and right side for easy carrying. Each slot or divider is approximately 3 inches square. We also have crates that hold 24 soda pop bottles too! Great gift and collectible! While you may find wood soda bottle crates online or at traditional retailers it is highly unlikely you will find a crate designed like ours with the slates of real wood on the bottom as opposed to a solid bottom made with MDF. We do everything possible to replicate real soda bottle crates from the 50's and 60's.